Marrakech Desert Trips is a brand of a fully licensed & bonded tour company based in Marrakech. We are specialized in organizing Morocco desert tours , day trips from Marrakech , Morocco Sahara desert tours from Marrakech to Fes (Fez) , desert safaris to Zagora desert, Merzouga & Erg Chigaga. Our Marrakech desert tours and multi day excursions vary from a 2 days desert tour from Marrakech to Zagora, a 3 days Morocco Sahara desert tour from Marrakech to Merzouga, a 4 days Morocco desert trip combining Zagora and Merzouga, a 4 days Morocco desert tour to Erg Chigaga (Cheggaga) and Iriqui lake, an overland Fez to Marrakech desert tour, or a Marrakech to Fes desert tour with a camel trekking adventure as well as an overnight sleep at a Sahara desert camp in the middle of Erg Chebbi dunes for those of you wishing to combine the two imperial cities of Marrakech & Fes with Morocco Sahara desert in a single trip. 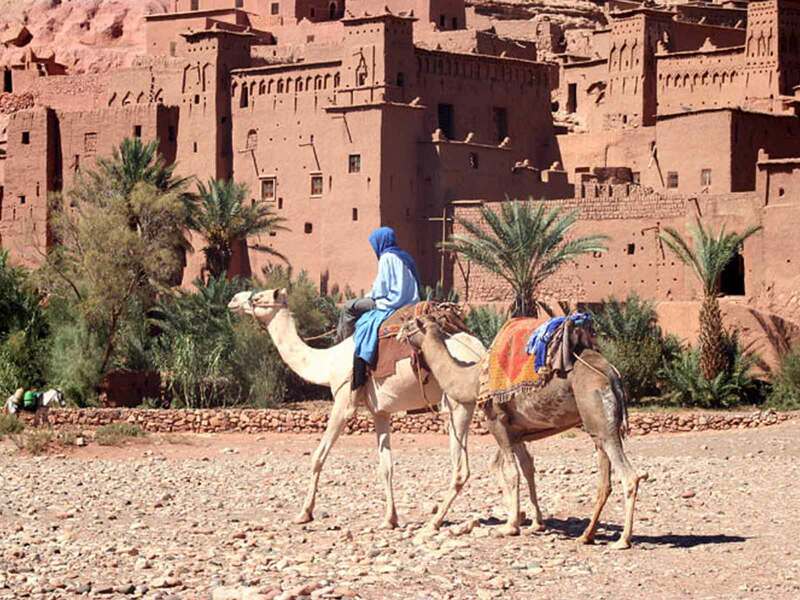 Our Morocco desert tours price is the best you can find in the market offered by a licensed desert tour operator. Price match and your satisfaction are guaranteed with us. From a day trip to Ourika Valley & the Atlas Mountains, a day tour to Ouzoud waterfalls , a Marrakech excursion to Ouarzazate & Kasbah Ait Ben Haddou, or even an Atlantic coast escape to in a full day excursion to Essaouira from Marrakech. Daily departures are guaranteed every morning to join a small group tour in an A/C modern minibus with an English speaking driver / guide. Should you wish to have a fun morning or afternoon at the outskirts of Marrakech with your family or friends, we have included a Marrakech quad biking half day adventure in the palm grove and a Marrakech camel ride under the shades of the palm trees with a visit to a Berber house. Private Marrakech excursions and day trips are also available per request. Our experienced team will be able to tailor your private day trips and activities from Marrakech to respond to every one’s tastes, budget, interests and group size. At MARRAKECH DESERT TRIPS, we pride ourselves in organizing hassle-free private and budget shared desert trips from Marrakech. We guarantee daily shared budget Morocco desert tours departures from Marrakech all year long no matter how many bookings we get. Upon confirming your Marrakech desert tour reservation, you will receive a confirmation email with your voucher. Sit back, and leave our experienced English speaking drivers / guides show you Morocco’s Atlas Mountains, Kasbahs, oases and sand dunes with lots of pride and enthusiasm. Every Morocco desert tour from Marrakech or Fez includes an overnight sleep at a Sahara desert camp & a camel trek in the sand dunes of Erg Chebbi, Zagora desert, or Erg Chigaga dunes to watch the sunset & the sunrise. Our motto is attention to details with full understanding that quality private or shared Marrakech Desert Tours, day trips & excursions should allow you interact with the local Berbers and Nomads of Morocco Sahara desert. For that reason, your drivers will arrange exclusive visits of the fortified villages or Morocco Sahara desert nomad camps built in the middle of nowhere, share a cup of mint tea with them and listen to their stories to have a great Sahara desert trip experience. All our vehicles be it minibuses for shared Budget Morocco Desert tours from Marrakech or 4×4’s and deluxe minibuses for the private Morocco desert tours are air-conditioned driven by local experienced and friendly drivers / guides that do speak English, French and sometimes Spanish. Should you need a customized itinerary for you, your family with children, or friends, we will be more than happy to assist you tailor your dream Morocco Sahara desert tour itinerary to suit your budget, timetable, and points of interest: Archaeology, astronomy and geology desert tours are among ou specialty themes. We have very special rates for student groups willing to travel from Marrakech to Morocco Sahara desert. We have served different international university students travelling from Marrakech to Merzouga or Zagora desert and Fes. For any questions regarding our Morocco Desert Tours from Marrakech, or should you wish our sales team to customize your dream desert tour from Marrakech or fes, please do not hesitate to contact us; we will be delighted to assist. “The desert is a full and empty space, at the same time hostile and fertile, warm and cold, calm and stormy. I loved it, I was adopted by it, I tried to conquer it but to no avail. Many times I wanted to run away but it always kept me. May I invite you to share my passion of the desert and my love for it in an amazing tour to the Moroccan Sahara desert? Admire the dunes, listen to the silence, feel it, feel its energy. You have the desert for yourself in the best possible conditions. Embark on an unforgettable journey. Marrakech Desert Trips offers two types of Morocco desert tours: private and shared, both follow strict guidelines set by our mother company EXTRA MILE , and your satisfaction is guaranteed. Our Marrakech desert tours price is the best available in the market by a licensed Moroccan travel company that operates Morocco desert tours within the local regulations.